The black 1999 Honda Valkyrie for sale is a LOADED 1999 Honda Valkyrie Interstate GL1500CF that has a full fairing, hard storage, passenger comfort, 2 shoei full face motorcycle helmets (sizes XL and M) with intercom system, CB and radio,leathers, battery tender, owners manuals and LOTS of chrome. Plus it has new front and rear Dunlop tires and it was just serviced, no miles! IT HAS 31,580 miles on it, the pink is in hand and it is ready to ride. If you would like to write a review or voice any opinions on the nice, used Honda for sale, you may use the comments form below this ad to do so. 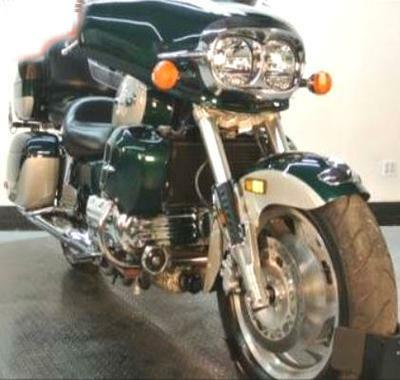 Thanks for visiting GoGoCycles Used Motorcycles for Sale and for taking a look at my 1999 Honda Valkyrie Interstate GL1500CF. The location of the bike for sale is Shafter (Bakersfield CA California area) and in my opinion my asking price for this bike is cheap enough that it can't be beat on Craigslist or Ebay; only $8500 NO trades or you are welcome to submit a best offer bid when you call me. If you want to take a look or have questions, call me (NO EMAILS)661 333-6three34 for more details and don't forget to mention that you found this ad on GoGoCycles Used Motorcycles and Parts for Sale www.gogocycles.com.